As previously mentioned, the most common elements used in waterbalance and irrigation-scheduling models are plant, soil, and weather. A first draft of the conceptual diagram is presented in Figure 10-1. Figure 10-1. Conceptual model for water-balance and irrigation-scheduling models. As shown in Figure 10-1, Plant and Soil are linked with a bidirectional association referred to as growsln. This association shows that a plant grows in soil and takes from soil all the nutrients that are needed for plant development; the plant consumes nutrients that are located in soil. Processes occurring in Plant need Soil data and vice versa; processes occurring in Soil need Plant data. 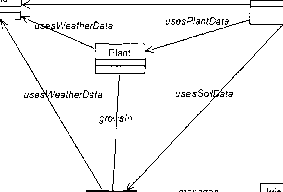 Both, Plant and Soil, are connected via a unidirectional association to Weather, referred to as usesWeatherData that expresses the fact that plant and soil are affected by the weather conditions. The conceptual model presented above does not take into consideration the fact that additional water is provided by the means of irrigation when there is a drought for a considerable amount of time. Therefore, another element needs to be added to the conceptual diagram: The irrigation management element. Figure 10-2 shows the modified conceptual diagram. Figure 10-2. Conceptual model with irrigation management considerations. 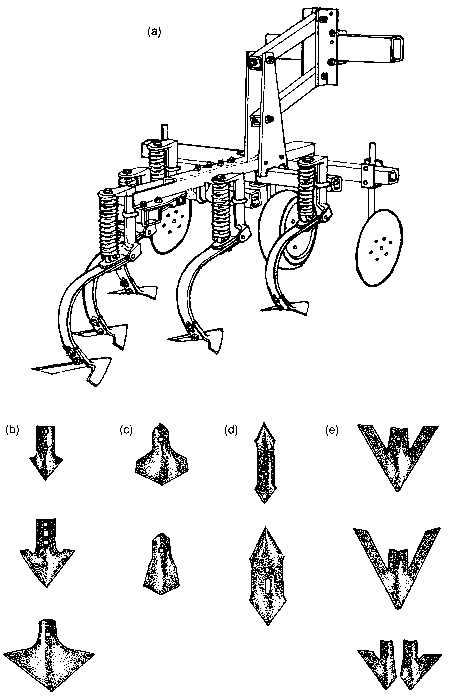 Figure 10-2 shows that irrigation management practices will be applied to soil and plant in order to improve production yield. The association manages that links Soil and IrrigationManagement is bidirectional, meaning that processes occurring in soil need irrigation management data and calculations occurring in the management need soil data. It is important to note that it is not always easy to define the nature of the associations among the elements of the model. As we are yet in the phase of developing a conceptual model, not all the exact relationships between elements can be defined at this point. The more we advance in the model construction, the more we will know about the collaboration between elements of the model and the more precise the model becomes. As an example, some association that we have considered as unidirectional may become bidirectional as we learn that data from the class located in one side of the association are needed to calculate processes in the class in the other side of the association. The process of developing a complete, detailed, and exact model is an iterative one. The calculation of some processes requires data from several elements of the conceptual model and cannot be assigned to a particular element. Such processes are the calculation of évapotranspiration rates; they usually need data from soil, plant, and the weather elements. Therefore, an additional element needs to be added to the conceptual model to carry out these calculations. This element, referred to as SoilPlantAtmosphere, will be assigned the task of performing these calculations and is added to the conceptual diagram as shown in Figure 10-3. Figure 10-3. Conceptual model that considers soil-plant-atmosphere processes. As shown in Figure 10-3, a new element, the SoiiPlantAtmosphere, is added to the conceptual diagram to account for évapotranspiration rate calculations. In order to perform these calculations, SoiiPlantAtmosphere needs to have access to other elements containing these data. 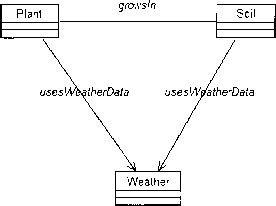 Thus, the unidirectional association usesWeatherData between SoiiPlantAtmosphere and Weather allows access to weather data. The association usesPlantData allows for accessing plant data and the association usesSoilData allows access to soil data. The conceptual diagram presented in Figure 10-3 seems to cover all the elements and their relationships needed to calculate processes that occur in soil, plant, and atmosphere that are required to calculate the amount of water needed for irrigation. The relationships between elements are independent of the type of equations used in the model and of the programming language used for the implementation of the model. A general structure, representing all the elements involved in a water-balance or irrigation-scheduling model and their relationships is developed to serve as a general template for developing new models.